I don’t have a light and cheerful lead sentence for this post, because it centers on the fact that my mother died recently. She passed away unexpectedly on August 17, and her death will cause fundamental change in the lives of all her children and grandchildren, along with her first great-grandchild, Charlotte, a.k.a. Charlie, who joined our family just barely a year ago. As I was pulling weeds in mom’s backyard a day before the funeral, I realized that her death also begins the inevitable separation of our gardens. 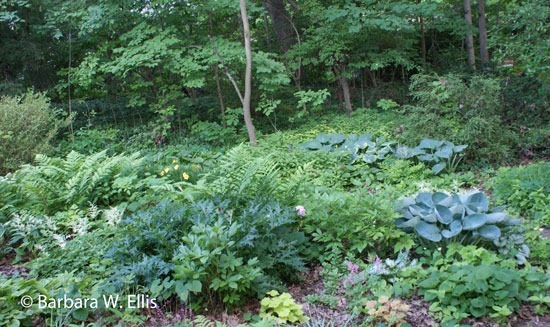 ABOVE: The sunniest part of mom’s garden, located on the edge of her woods, is cram-packed with hostas, ferns bear’s breeches (Acanthus spp. ), peonies, and more. Surprisingly, thinking about our life-long connection as gardeners, and not just as mother and daughter, brought more comfort than sadness. It also yielded insight into the plants I love and why I garden the way I do. The first layer of connection between our gardens consisted of plants traded back and forth. Initially, I was on the receiving end of most of the acquisitions. Peonies that now bloom here in Maryland for me—and thrived in my gardens in Alexandria, Virginia, and Emmaus, Pennsylvania—came from her garden. Originally, the plants came from my Aunt Hattie’s garden. Properly known as Harriett Nace or Mrs. Edward Ellis Nace, Aunt Hattie was actually our great- great-aunt. 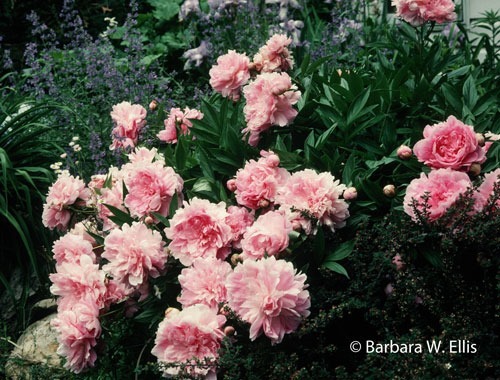 She and my great grandmother commonly shared plants, so the same peonies undoubtedly grew in her garden as well. Mom’s garden was basically all in the shade, but she nurtured our family peonies for years despite the fact they rarely bloomed for her. Once I had a garden of my own, she shared them with me. ABOVE: Peonies passed on by my mother blooming in my Pennsylvania garden. They now bloom in Maryland as well. I also owe the clumps of yellow trillium (Trillium luteum) and white trillium (T. grandiflorum) that dot my springtime garden here in Maryland to my mother. Both grew with enthusiasm in her shady woodland, and she had plenty of seedlings to share. 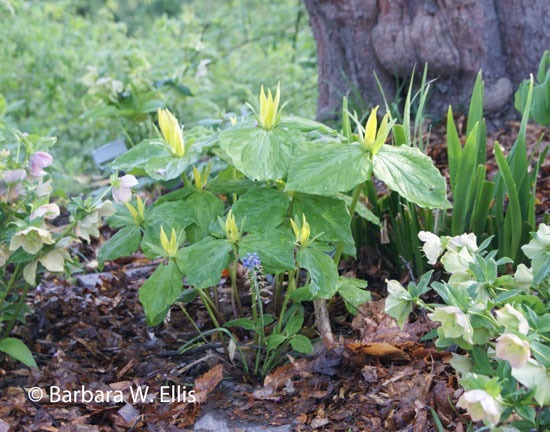 Above: Trillium luteum in Maryland from mom’s Ohio garden. ABOVE: A piece of this clump of Indian pink (Spigelia marilandica) traveled from my mother’s Ohio garden to mine. 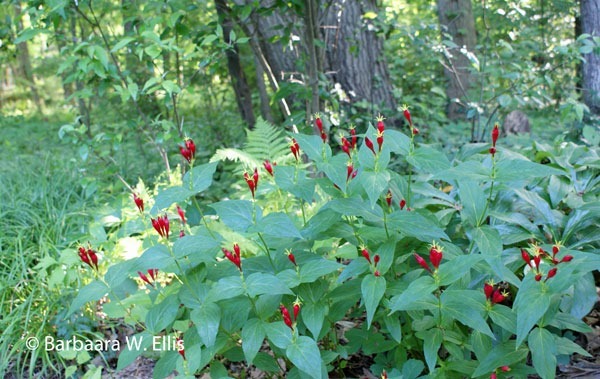 Indian pink or woodland pinkroot (Spigelia marilandica) is another great addition from mom’s garden. This species, just coming into its own in my garden, is native in Maryland but not in Ohio, where she lived. My plant was very nearly overrun by bed mates before it really became established. (Indian pink does not appreciate being moved.) Fortunately, I noticed its dire predicament this spring and thinned out the plants around it. My clump bloomed this summer. 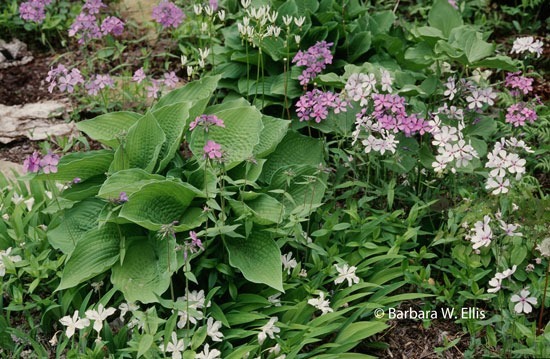 ABOVE: White shooting stars (Dodecatheon meadia ‘Alba’), originally from mom, grow in my garden along with another childhood favorite, wild blue phlox (Phlox divaricata). Last summer, mom sent me a small box of ramps (Allium tricoccum ) she collected in the backyard. Also called wild leeks, I had requested them, and these turned out to be the last plants I received from her. I remember gathering the dry, umbrella-shaped seedheads in the backyard as a child. The shiny, round, black seeds seem to simply balance atop the dry receptacles and rolled everywhere if jostled evenly slightly. Mom sent both bulbs and beadlike seeds to send me, packaging them up with a brief note and a newspaper clipping or two that she thought would be of interest. These latest transplants are still coming along in pots and will go into the garden next year. ABOVE: Hosta ‘Golden Tiara’, an unnamed astilbe, and bear’s breaches (Acanthus mollis) in mom’s garden. Pulling a few weeds before friends and family came for visiting hours seemed appropriate. Mom would have wanted her garden to look its best. As I worked in the sunniest portion of her garden, it was clear that plants I had shared were equally important to her. A lush carpet of ferns, epimediums, hostas, and other favorites from my garden crowded every nook and cranny. As I developed as a gardener as well as a professional horticulturist and garden writer, I tended to pull her farther into gardening than she would have gone herself. Yet she always followed with enthusiasm. I dragged her to nurseries specializing in rare plants, and she introduced me to a few as well. She found someone to help her pull English ivy, when I pointed out that it was attempting to take over her beloved woods. As I thought about her garden and mine, I realized our connection runs deeper than shared plants and joint weeding sessions. There are links of vision and intent that will continue to be fundamental to the way I garden. ABOVE: The gardens I build will always owe a debt to mom’s garden, both because of the plants I grow and the way they are arranged. 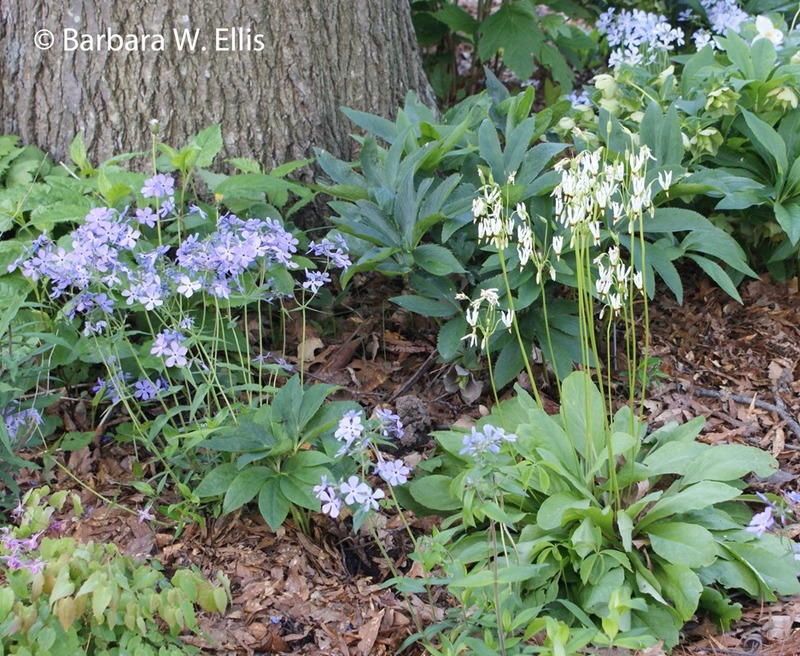 Here, white and blue flowered native wild blue phlox (Phlox divaricata) and white shooting stars (Dodecatheon meadia ‘Alba’) grow with hostas in one of my Pennsylvania beds. Despite the suburban homes popping up all around them, my parents preserved an island of wildness. While neighbors whose property adjoined our woodland struggled to establish lawn beneath their portions of the woods, my mom and dad nurtured understory trees and begin planting wildflowers. I remember transplanting bluebells and other natives from nearby woodlands threatened by bulldozers, and I also helped during family wide daffodil bulb planting days. 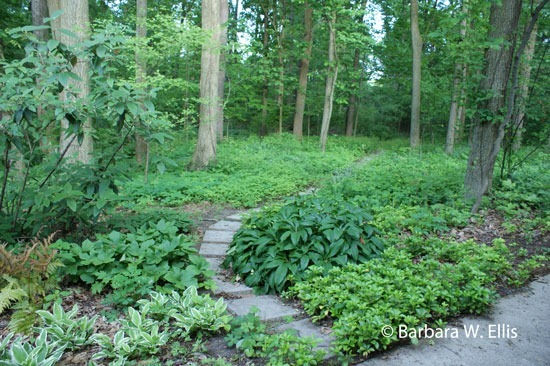 ABOVE: Stepping stones lead into the woods behind my mother’s Ohio house. Colorful in spring, by summertime it features many shades of green. I am happy to report that mom’s neighbors gradually gave up their unsuccessful attempts at cultivating lawn grass under woodland trees. Even when I was a child it was obvious to me that our woods was lusher and more beautiful than their otherwise similar backyards. Their yards featured the same trees but just scraggly grass. The lesson of their futile struggle stuck with me, and I have passed it on many times. What also stuck is my parent’s wilder, more naturalistic approach to gardening and landscaping. My vision of what makes a successful planting will forever be rooted in my mother’s woodland garden, where suburban-lawn conformity was never the vision. I love creating plantings that are closely tied to the shape and character of the place where I garden. I also love dealing with the unique challenges each garden sets forth. After all, her’s is the first garden I remember, and it featured alkaline clay soil in shade, a combination of conditions that most books do not address. Nevertheless, my mother always grew a wide range of plants despite the soil conditions. ABOVE: Plants that tolerate Maryland’s hot, humid summers, drought, and winter rain predominate in my front garden. In Pennsylvania, dealing with existing conditions meant I learned to stack stone walls, since it was imperative that I deal with the multitude of boulders every new garden spot yielded. Here in Maryland, the challenge is finding plants that thrive despite summer heat and humidity as well as winter wet. 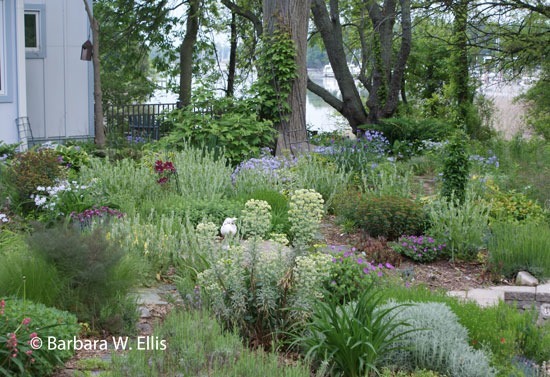 In both gardens, I incorporated existing land forms and trees to minimize disturbance. I resisted removing black walnuts and instead found that loads of plants happily thrive in their shade. Mom’s garden was always spectacular in spring. Like most gardens, by late summer it was a tad blowzy. Still, colorful flowers and thick, handsome foliage always covered the ground—plus a thick blanket of oak leaves. This year was no exception. My husband and I were visiting her the week she died. We were on our way back through Ohio from a trip, and she was very interested in the treasures I had picked up at Arrowhead Alpines in Michigan. I had picked out enough plants to fill a flat, and a couple of days before she died we had a good conversation about the late-summer to fall-blooming ornamental onions (Allium thunbergii ‘Ozawa and A. beesianum) I had purchased, plus the hardy native spinystar cactus (Escobaria vivipara), blue-gray leaved Sedum cauticola, a 4-inch-tall, evergreen ground cover, and more. It was clear she had designs on getting slips of any of them that would have survived in her garden. That week she also fretted about the weeds in her garden, but what gardener doesn’t fret about weeds in August? I am thankful we had a chance to talk about plants and gardens that week, and that we were at home visiting when she died. I will be forever grateful that I made myself write this post. As you can imagine, it has not been easy. Fortunately, writing it has left me happy as well as sad. Contemplating the deeper roots of why or how I garden is not something I do naturally. I had not thought about the fact that our gardening connection was much deeper than trading plants or even exploring nurseries together. I am now fully aware of the fact that there always will be a vital connection. Her garden will continue to inspire and guide mine as I create new plantings, tinker with bed combinations, and add new plants. For me, that is a silver lining. Wonderful article and pictures, Barbara. I sure it was hard to write this post…but writing down your thoughts does help a person heal from such a loss. Thanks Val. I was especially pleased that I took some pictures of her garden a year ago that I could share. Thanks so much. While I knew that I had plants from her garden, I hadn’t really thought about the deeper connection relating to design and vision. Writing about it helped a lot. A beautiful tribute to your mother. I’m sure it was very hard to write; thank you for sharing. My mother and grandmother passed on their love of gardening too and I can relate to cherishing those memories and plants that have been shared. Hi! Thanks so much for writing. As I was working on this post, I also found pictures of my grandmother’s garden and my Great Aunt Hattie’s garden. I spent many an afternoon helping in Aunt Hattie’s garden. (Maybe I should say “helping,” since I am not sure how much real work I did.) I love thinking about the shared traditions. Thanks so much. The shared tradition of plants and inspiration is such a vital part of gardening, yet it think it is often overlooked. I loved the day we arrived at your house with the “garden in a car” and won’t ever forget installing it in your backyard! Such fun! It is funny, although I have always had more sun in my gardens than my mother ever had, the woodland wildflowers and non-native shade plants have always been my favorites. I really had a great time working out all those connections while writing this post. What a moving tribute to your mother and her gardening grace. Kind of you to share it with us. I’m glad you liked it. I must be a writer at the core, because figuring out how to write about something always brings much more insight than talking about it. Organizing my thoughts in a post and searching around for pictures to illustrate it helped me work through at least this aspect of her death. I understand about writing – and you are better at it than most! Ooh, thanks! You would think by this time it would be easy, but it isn’t! I am so sorry for your loss. I hope it is a small comfort to know that strangers care. The legacy of a garden lives on as long as there is a vestige of a plant, or a similar species that calls up a memory. It is a comfort, thanks so much for writing! I love your thought about the legacy of a garden. Thanks for sharing it. We are home from our trip, during which we often shared memories of Jane Ann and things she would have enjoyed doing with us. I loved reading your thoughts and learning more about your connections as mother and daughter. We loved experiencing new things with Jane Ann, or going back to familiar places, such as Lake Erie for warblers and Boca Grande for walks in her favorite Florida places. Revisiting these areas will bring back many memories and never be quite the same without Jane Ann’s comments as she enjoyed everything we saw. Thanks for sharing the wonderful photos and memories. What wonderful memories. Thanks so much for visiting. I think of her all the time, too, and she pops into my head at the strangest times. Hi, Barbara, I was sorry to read about your mother’s death in the course of sending invitations to a memorial for my own mother, Frances Tenenbaum. I’m pretty sure she edited one of your books — and you are in her address book. My mother died on Sept. 24, and was a huge influence on me as a gardener and lover of language, among other things. You can reply to me directly, if you’d like (tenenbaumdesign@gmail.com). Your blog is great — I’m signing up!